Easy-Going & Colon Clean Herb Tea is made of wild rhubarb (rhei rhizoma) and cassia seed. They provide emodin, chrysophanol, aloe-emodin, vitamins A. B. C, glucoside, rhein, sennosides A. B. C., etc. Chinese medicine uses them to moisten and cleanse intestines and to facilitate easy bowel movement. 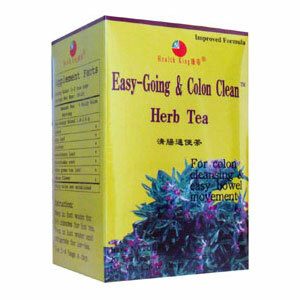 Easy-Going & Colon Clean Herb Tea is made of wild rhubarb (rhei rhizoma) and cassia seed. They provide emodin, chrysophanol, aloe-emodin, vitamins A. B. C, glucoside, rhein, sennosides A. B. C., etc. Chinese medicine uses them to moisten and cleanse intestines and to facilitate easy bowel movement (constipation).